Rosettes are a fragile and very pretty deep-fried pastry originating in Sweden, usually eaten at Christmas. A special rosette iron is needed to make them. Rosette irons in various shapes are available in specialty cooking shops and department stores. The trick to making good rosettes is to preheat the iron in the oil, and to be sure not to dip the iron so deeply into the batter that it coats the top of the iron. Mix eggs, granulated sugar and milk (I prefer to use the blender). Stir in flour and salt, beat until smooth. In 3-quart saucepan, heat 1-1/2 inches of vegetable oil to 350° for timbales or 400° for rosettes. Heat rosette iron in oil, drain; dip into batter (it should sizzle). Fry in oil until golden in color. 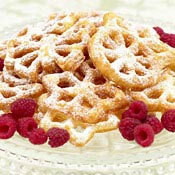 Dip rosettes in powdered sugar or in mixture of granulated sugar and cinnamon. Makes: Approximately 6 dozen Rosettes. Timbales are pastry shells, made by dipping a Rosette Iron with Timbale Shell attachments first into a batter, then into deep, hot fat. When the crisp pastry is pushed off the iron and cooled, it can be filled with a sweet or savory mixture. Timbale irons come in various sizes and shapes such as hearts, stars and butterflies. You can use this recipe to make timbales. Fill just before serving with pudding, pie filling, fresh fruit, ice cream, sherbet, etc., for dessert. Or for lunch, fill with creamed vegetables, chicken or meat salad, tuna salad, fruit salad, scrambled eggs, etc. *Note: You can purchase Rosette and Timbale Irons at many stores on the Internet, such as Cooking.com or Gooseberrypatch.com. If you wish, you can click on Cooking.com's banner on my website to find the rosette irons at this internet cooking store. *Note: Rosette/Timbale Irons are also available in specialty cookware stores. Nordic Ware makes a very nice Rosette/Timbale Iron Set. It may can be purchased online at: Kitchen Kapers (http://www.kitchenkapers.com). I just got a set of old irons and need the recipe. This will be a great change for the younger kids. Thank you. Just like I remembered as a little girl, wonderful! Lovely! This recipe will earn a place in my recipe file. Thanks so much!!! I MAKE ROSETTES ALL YEAR LONG BUT THIS YEAR I LOST THE RECIPE FOR THESE COOKIES AND MY GRANDKIDS WERE VERY UPSET. THANK YOU FOR THE RECIPE. I have my Grandmother's old irons. I needed the recipe. Thank you! Awesome, but I also make chocolate ones by adding cocoa to the batter. Can any of you please tell me how you store the timbales? Mine were a little blah this morning. Wow, this recipe is the best. I make the Rosettes every year for my friends "cookie swap" Not a crumb of my cookies remains! Suggestion: Clean the oil, heating heavy pan with soap and water, rinse well and keep it sealed in plastic for next year. Believe me, this is good advice. I tried them so many times but they were not good and they would break in pieces. Thanks a lot. It's gonna go in my recipe book!!! This recipe is great... just like my mom made every Christmas. Bought a rosette maker at a thrift store and taught my daughter how to make them. This recipe makes about 10 dozen. This recipe is ok,but I make rosettes every year. I have the large iron and I put 2 teaspoons of cinnamon in the batter and also a little nutmeg, about 3/4 of a teaspoon...makes them more flavorful..There is a Norweigian restaurant that makes these at Christmas in Wisconsin and charges $18.00 a dozen. I believe that is a bit outrageous, I would charge that for the LARGE ones but they sell the small snowflake. Thank you for this recipe. My mom made these for us. In honer of her birthday, I will make them Feb.21. Finally I have found the recipe!!!!!! My grandmother gave me her kit to make these years ago, but she couldn't remember the recipe, and there is only one continental store that sells them an hrs drive from me. Now I can make them myself for my children to enjoy. wohoo! !